A VILLAGE official died while his companion was injured in a collision of a motorcycle and a dump truck along the highway of Zamboanga del Norte, the police said. Police Major Helen Galvez, Police Regional Office-Zamboanga Peninsula information officer, identified the fatality as Roberto Buhale, 59, a councilor in Cabong village, Naga, Zamboanga Sibugay. Wounded was Buhale’s back rider, Anel Gandangan, 28, also a resident of the village of Cabong. 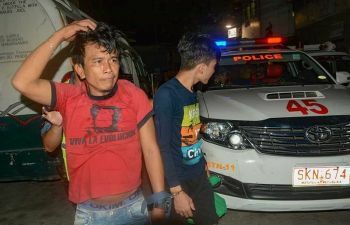 Galvez said investigation showed the victims, who were traveling aboard a motorcycle, collided with a dump truck driven by Jimsun Telmo, 27, when they overtook another motorcycle along the highway around 6:30 p.m. Wednesday, March 20, in Molos village, Tampilisan, Zamboanga del Norte. She said the victims were traveling from Liloy town to the town proper of Tampilisan while the truck was running on opposite direction at the time of the incident.